Test lab AV-Comparatives has published the results of comparative testing of 20 antivirus products for detection of malware and false positives. 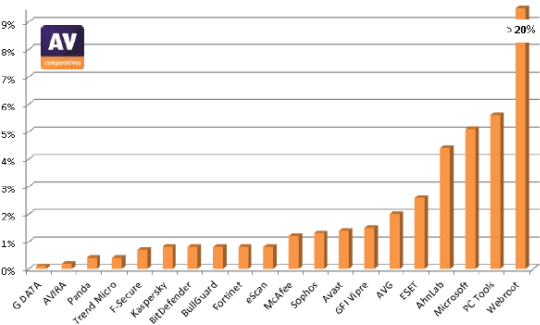 The test used the 240,859 malware samples. Participate in a comparative test AV-Comparatives is limited: no more than 20 internationally renowned antivirus vendors have agreed to participate in a series of public tests of 2012. 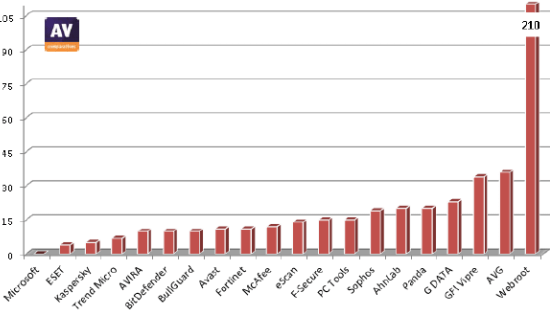 Collection of malware was “frozen” 21, August, 2012 and consisted of 240,859 samples. Antivirus has been updated before the test August 28, 2012. Note (Information on the use of additional third-party anti-virus engines / signatures): Bullguard, eScan and F-Secure are based on the engine BitDefender. G DATA is based on the engine, Avast and Bitdefender. PC Tools uses signatures Symantec. Most antivirus programs are run with the maximum settings by default. Some antivirus automatically switches to high settings, when found malicious files. This makes it impossible to check protection against various malicious programs with the real “default.” In order to obtain comparable results for some products were found high settings or settings have been reduced – in line with the recommendations of the vendors. Part of the anti-virus uses cloud technology that require an active Internet connection. AV-Comparatives tests performed with an active Internet connection. Users should be aware that the level of detection may be in some cases significantly lower than if the test is performed without connecting to the Internet (or the ‘cloud’ is not available for various reasons). “Cloud” should be considered as an added advantage / feature to increase the level of detection (as well as the response time and reduce false alarms), and not as a full replacement for local signature-based detection. * These products have won awards because of lower false positives. Awards take into account not only the level of detection, false positives are also considered when checking clean files. Antivirus, which has a high percentage of detected malicious files, but it suffers from false alarms, can not be better than an antivirus that detects malicious files smaller, but produces fewer false positives. 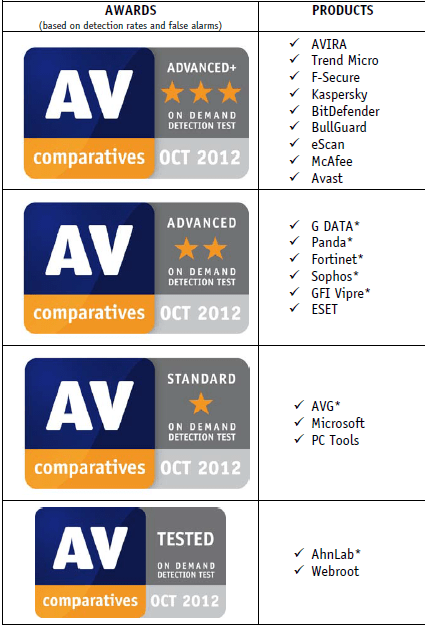 Comparative testing of antivirus AV-Comparatives October 2012: Full report.